Do Your Kids Need Asset Protection? Dynasty Trusts are trusts intended to last for an extended period – sometimes several generations. One benefit is that estate tax can be reduced or avoided as amounts are passed from children to grandchildren and to subsequent generations. As of 2013 the federal estate tax is effectively eliminated for the first $5.25 million. A husband and wife can pass up to $10.5 million to children (or others) free of federal estate tax. For estates which are larger than this amount, a Dynasty Trust may be essential to preserving wealth from taxation at each generation. Those with less than this amount would not be gaining estate tax savings but could save on state inheritance taxes in states with a lower taxable threshold. Asset protection may be the most important reason for establishing a Dynasty Trust. As discussed below, the assets of a Dynasty Trust are generally not subject to judgement collection or divorce claims. Many of our clients are concerned about leaving hard earned savings to a child – no matter what the amount – and then having the amount lost in a divorce. Unlucky or poorly chosen investments by a family member can also jeopardize an inheritance. Dynasty Trusts can be drawn to protect these amounts from outside claims to make sure that the estate is maintained and preserved for all intended beneficiaries. As part of the political debate about tax cuts and estate tax, a type of trust known as a Dynasty Trust has received a barrage of criticism from those who claim that the wealthy are not paying their fair share of the taxes. A recent Op-Ed in the New York Times complained that Dynasty Trusts created a powerful new “aristocracy” whose wealth is protected and untaxed for generations into the future. Sounds appealing right? Let’s look a little more closely at the available benefits and whether these trusts may have a role to play within your overall estate plan. How Long Should a Trust Last? The first point to note about the Dynasty Trust is that it is designed to last for a long time. Many states have recently adopted legislation (abolishing the Rule against Perpetuities) which eliminates legal restrictions on the period of years that a trust may last. Now, in these 23 states, a trust is permitted to exist for whatever term is chosen – even if it reaches far off generations many years in the future. In Nevada, a Dynasty Trust is permitted to last for up to 365 years. Who might want a trust lasting generations into the future? Estate plans are typically designed to include some type of trust to take care of the needs of minor children upon the death of the parents – usually lasting until the ages of 21 or 25 or so. It makes sense to limit the term to this relatively short period of time when the trust fund contains an amount that the child might exhaust for basic living needs or for the expenses of college and higher education. If there is not going to be anything left over after covering the child’s basic needs, an extended term trust would not make sense. It is a different matter when family wealth consists of substantial accumulated savings, a valuable business or a large insurance policy. In these cases, the issue of how long a trust should last assumes much greater significance and specific questions must be addressed. At what age do we want a child to receive a full distribution of substantial trust funds? Should we make large sums of money available to the child when he is young or do we want to control and limit the distributions based on whatever standards we can define for need, responsibility and maturity? These are not easy questions to answer, especially for children who are young when the trust is formed. The answer to the question of how long the trust should last is often based on two key considerations-the estate tax consequences of the plan and the possible need for asset protection. It is true that substantial estate tax savings can be created by the Dynasty Trust. As you probably know, the federal estate tax normally imposed as wealth is transferred from parents to children. Each time the wealth is passed to a younger generation a new estate tax is imposed. At a 50 percent estate tax rate, a dollar in wealth is reduced to 50 cents when it is passed on to your children. The remaining 50 cents is further taxed so that grandchildren would receive only 25 cents of the original dollar and so on until there is nothing much left. For those whose total assets are under the estate tax exemption amount (currently scheduled at $1 million for 2011) this is not a problem since amounts under the exemption are not subject to federal estate tax. Those who have accumulated assets in excess of the exemption amount or who have large insurance policies and wish to maximize and preserve these funds for future generations, can significantly reduce estate taxes with a properly structured Dynasty Trust. Whether or not you have a need for estate tax savings, the Dynasty Trust is a popular strategy to help protect children from the risks of divorce and creditor’s claims that they may face in their personal life and business careers. Possible claims by a child’s current or future spouse is always a paramount concern in every estate planning discussion. Facing hard facts, a 50% divorce rate means that there is a substantial financial risk of losing assets to a spouse at some point. Dynasty Trusts are often designed to specifically address this issue to make sure that amounts intended to be the separate and protected property of a child are not available to a future claim by a divorcing spouse at any point in the future. The same logic applies to other types of potential creditors that may arise during a child’s lifetime. Some common examples of these risks include student loan debt which is almost impossible to discharge, personal guarantees on loans and debts from bad business decisions or just plain bad luck which can cause lasting financial hardship and burdens. The point of the Dynasty Trust is to make sure that a nest-egg is preserved for the child which is not subject to lawsuit and liability claims no matter what happens in the future. Depending on the outcome of the estate tax legislation proposed in Congress your estate may be subject to significant estate taxes as it is passed to your children or grandchildren. A Dynasty Trust may be useful in reducing or eliminating these taxes as well as preserving family assets from future claims and liabilities. These issues are complicated from a legal and tax perspective however and as always you should discuss your personal situation and the possible benefits and drawbacks of this planning with your professional advisors. Cook Islands Trusts: Prudent Planning or Tools for Scoundrels? Are Secret Accounts and Offshore Havens Gone for Good? 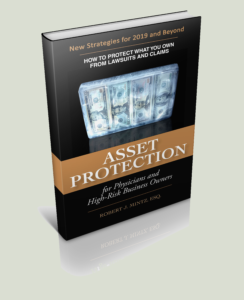 When Is It Too Late For Asset Protection? What happens When You Can’t Pay Your Mortgage? What is the Best Asset Protection for Physicians?